Brake discs are typically made of one type of material or another: either cast iron (in most cases) or a mix of carbon and ceramic (in more exotic applications). But Porsche has developed another process that could bridge the gap between the two. The German automaker has equipped the latest Cayenne Turbo with the new Porsche Surface Coated Brake (PSCB). The rotors are still made of cast iron, but are coated with a special layer of tungsten carbide. It wasn't cheap to develop and it's not easy to manufacture, but the results speak for themselves. To apply the coating, the cast-iron disc first needs to be roughened and cleaned. Then an intermediate layer is applied before a high-velocity oxygen fuel burner can apply the thin late of tungsten carbine, which is then polished with industrial diamonds. Once complete and worn in, the corrosion-resistant coating takes on a mirror finish. "High-performance brakes are a hallmark of the Porsche brand," Austin Latchaw, Porsche's crossover product manager, told Automotive News. "This is actually a technology we have wanted to offer for quite some time, but we needed to find the right supplier to work with." Like the (still available) carbon-ceramic rotors, the PSCB uses ten-pot calipers at the front and four pistons at the back, painted white to highlight the reduced brake dust. 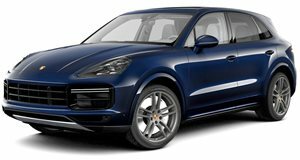 They come standard on the Cayenne Turbo, and are available as well on the base Cayenne and Cayenne S. Porsche plans on rolling them out on additional models in the future.